The GameBook Authoring Tool will help you plan, design and build gamebooks, branching stories, “Choose your own Adventure” style books and interactive novels. 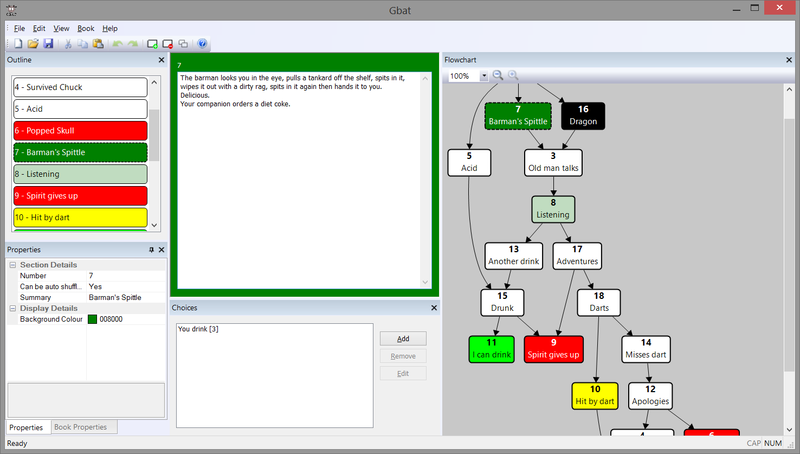 See the flowchart of your gamebook. See which sections are missing or unreachable. See unlinked and lonely choices. Auto-shuffle your section numbers and generate the framework for your book. Export formats include HTML, TXT and RTF. Save your flowchart as an image. Free version (100 section cap) and Pro version available. Requirements: Windows 10, Windows 8, Windows 7, Vista or XP. Buy risk free: 30-day money back guarantee.